On Friday night, at around 11 PM, I was out in Adams Morgan with friends when I received a call and voicemail from an unknown number. The caller was one of my landlords, who had received a message from their alarm security company that an alarm had gone off at their unit above mine. The cops had responded, and although nothing seemed out of place, they wanted me to take a look. At about 12:30 I got home with my girlfriend and everything at the apartment looked normal (nothing out of the ordinary in front of the house, and the gate was locked in the back). About 20 minutes later I walked back into the kitchen and happened to look under our deck area, which was covered in shattered glass. I opened the door, ran upstairs, and saw that my landlord’s sliding glass door had been broken, most likely by a brick or rock of some kind. I immediately went back downstairs and called the police station at the top of 18th Street (again, Adams Morgan), who subsequently connected me to 911. I placed that call at 12:58 AM. After getting off the phone with 911, who assured me that a unit was being dispatched, I called my landlords to tell them what had happened. I told them that I would wait outside for the police to come, and they directed me to not enter the house for fear that someone might still be inside. 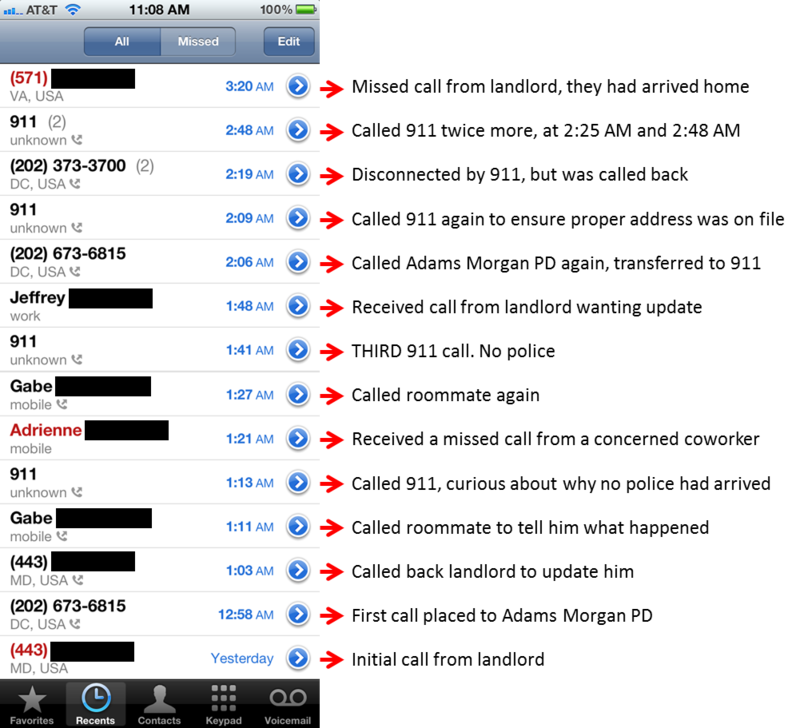 Following that initial call, I followed up with the police EIGHT times – between 12:58 AM and 2:48 AM – and not a single police officer showed (please see screenshots of my call history above). While I understand that the District is a major city where violent crimes occur every day, and that being a police officer must be an extremely challenging line of work, I am shocked and disappointed that a home burglary was not a higher priority for them. Over the course of nearly two hours not a single police officer came to our residence, and for all we know someone may still have been upstairs (something I reiterated to the operator more than once). I reviewed different DC blogs and the Washington Post’s crime section Saturday morning, but saw no mention of major incidents that occurred last night. I’m curious about what the “incident of higher priority” was, and would like the police to explain to me how they are able to allocate dozens of resources to oversee the drunken shenanigans occurring on 18th street but are incapable of sending a single unit to the scene of an actual burglary. I contacted my landlords via email on Saturday afternoon and learned that the police eventually showed up at 3:30 AM. Not only had their house been robbed, but our neighbors had been broken into as well. If you know of anything that happened on Friday night, or have other thoughts/opinions, please share.